Michael Borkowsky is an artist that I first encountered in April 2014 through the collaborative project COLONIZE. During this exhibition, which took place in two US galleries in Jamestown, New York, I bunked with Borkowsky and three other artists in the house of associated US artist / lecturer Debra Eck. Over the course of two weeks in Jamestown, where we were treated to interviews with local radio and newspaper and were also the subject of two short videos produced by a Jamestown based studio, I became au-fait with the rather phenomenological nature of Borkowsky’s practice. Upon entering the 3rd on 3rd Gallery during the COLONIZE exhibition the first thing that you would notice, before anything visual, would be the pungent aroma of food. For this project Borkowsky sourced local produce in Jamestown to produce his own paint. Once the paint had been made he then painted a board in a chequered pattern, each square in a different scent (colour). Here the expectations of the visual art exhibition are subverted by the dominance of the olfactory sense. Whilst audio has for some time been accepted, to a degree, as a relevant non-visual medium in the arena of visual art, smell is less common. Since the COLONIZE exhibition Borkowsky and I have remained in contact about his practice and exhibitions. Speculative Studios at BasementArtsProject was the product of a proposal submitted by Borkowsky in the years since COLONIZE, representing another line of enquiry in this artist’s unusual oeuvre. The main concern that comes through in his work is that of portraiture, and I am unsurprised to find that there is also a curatorial strand involved in this. With his practice he does not consider portraiture in the traditional sense but instead in a more expanded field. The Speculative Studio series, of which the exhibition at BasementArtsProject is one, takes a blindfolded snapshot of the practice of other artists and re-presents their potential studio processes by analyzing and working backwards from a finished artwork. For BasementArtsProject, Borkowsky proposed the re-creation of two artist’s studios; one of whom he had met before but did not know well, and the other whom he had never met at all, but both of whom he has exhibited alongside in other circumstances. Taking from each artist, with their permission, a single artwork from the COLONIZE exhibition, Borkowsky set out to recreate their individual studios, each one containing ephemera relating to that artist’s practice and the specific work. This could involve objects, instruments and materials in raw form, as well as self-constructed prototypes for the works that led to the production of the final works, effectively inserting a fictional narrative into the timeline of the original artwork. In all of the time spent creating these installations Borkowsky made sure that not only did he not visit the artist’s studios, but also did not enquire of any further details about their practice, life or working environment. One of the subjects for these analytical studio constructions was present at the opening night of Speculative Studios. It was interesting to hear his thoughts on Borkowsky’s speculations surrounding what would normally be a very private aspect of most artist’s lives. An amusing point in the artist’s analysis of the imagined work space was that in fact he, the subject, has no studio that he regularly works from, choosing instead to work from home. In terms of the kind of detail regarding the content of the non-existent studio, the artist in question described it as uncanny, with certain objects being identical in nature to the materials he would actually keep; maps, microscopes, test tubes containing samples for the microscopes etcetera. Borkowsky’s musings were also something of a pre-emptive strike in the direction that the artist / subject was in the process of making in his own work, a process begun during COLONIZE. Phenomenological portrait art as a tentative act of prognostication perhaps. The basement here at BasementArtsProject has over the years acted as many things from exhibition / performance space to screening room and workshop space for community engagement activities amongst other things. 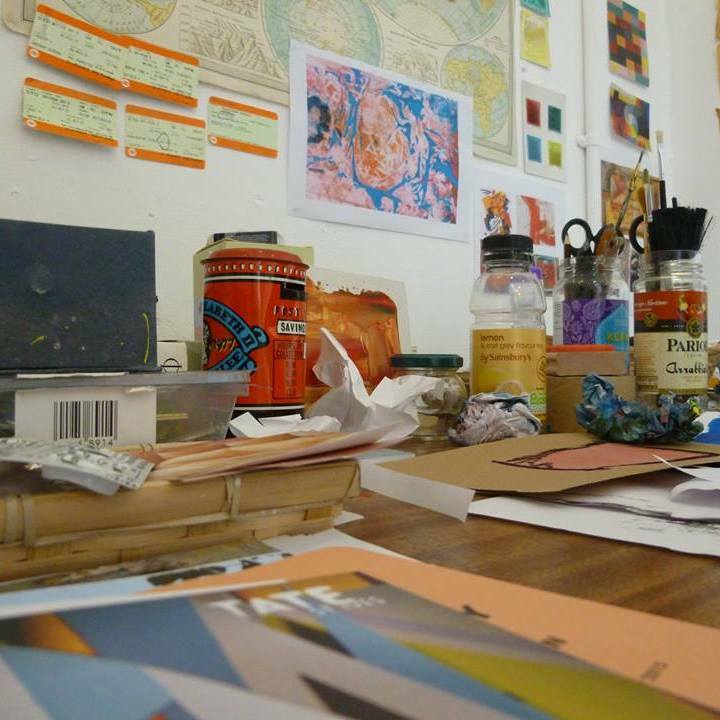 It has in this time also acted as an actual studio for the likes of Philip Gurrey and Alistair Woods during their residencies. Here though the studio is the artwork, a stage set, fiction based on an imagined reality. As with Borkowsky’s food substance paints and personalized perfumes, the Speculative Studios are contemporary ideas of portraiture, eschewing literal representation in favour of a more radical interpretation. Borkowsky’s attention to detail is almost forensic in nature, leading to very detailed and precise installations. Speculative Studios by Sheffield based artist Michael Borkowsky takes an artists' exhibition piece and questions how they arrived at their final idea. Through the construction of an installation that takes the outward appearance of another artist’s studio, Borkowsky looks at the notion of assumed identity and the implications of this surrounding ownership, authorship and the maintenance of public perception. Speculative Studio Spaces opens up a highly personal aspect of artistic practice and offers the audience an opportunity to engage with the processes behind production.